Flower City Glass has been providing residential door products throughout our 90 plus years in business. We sell, distribute and install almost any type of door product. Our sales people have the knowledge to provide quality manufactured products to meet the needs of our customers at the best possible value. We proudly carry Milliken Millwork exterior doors. Milliken offers a tremendous selection of fiberglass and steel door configurations, decorative glass door options, panel designs, and the largest selection of door materials. Looking for a specialty door? Milliken has steel security and fire-rated doors too. We are factory dealers for a variety of wood, vinyl, fibergalss or aluminum glass patio doors. Milliken Millwork offers a quality, durable glass patio door with many options to choose from such as grid work or blinds between the glass, divided lights or clear glass with external grills. Weather shield is a premium line of beautifully manufactured custom made wood, vinyl and fiberglass patio doors in a variety of configurations and thousands of styling and finishing combination to meet any design style. Wood patio doors offer a classic elegance with modern efficiency while vinyl patio doors offer great durability, energy efficiency and lower maintenance, and fiberglass patio doors boast superior strength, low maintenance and maximum energy efficiency. 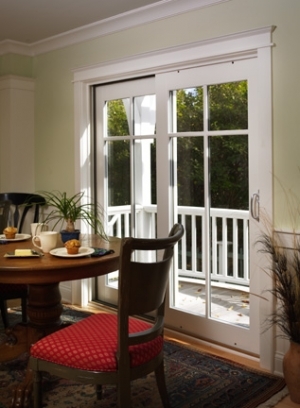 Glass patio door style options include hinged, sliding, bi-fold and telescoping. Atrium manufactures a line of vinyl and aluminum glass patio doors that carry the Energy Star ratings plus strength that delivers great value and lasting durability. Choose low-e glass for additional energy savings and protect furniture and fabrics from the sun’s damaging rays. Add screens, between-the-glass blinds and grilles for a premium look. Ecoshield makes a quality line of vinyl replacement glass patio door that offer a smooth performance, ridged structure and a glazing package that meets or exceeds the latest Energy Star rating. Atrium patio doors feature one rolling and one stationary panel, sill engineered for excellent drainage, integral single track, nylon rollers and dual point locking hardware. Protect your entrance door and add energy saving value to your home with a storm door at each entrance. 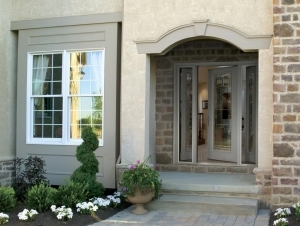 We carry Milliken Millwork storm doors because of their quality and durability. 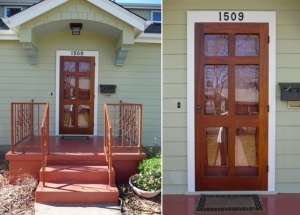 We also carry wood storm doors for historic houses or new houses that replicate a vintage look. YesterYear’s wooden storm doors come in a large variety of wood types, grill designs and plexiglass or tempered glass options. All doors are shipping with a removable screen framed in bronze or white to turn your storm door into a screen door in warmer weather. Copper and aluminum screening is available upon request as is priming. When your storm window glass breaks, the best way to replace it is to let Flower City Glass do it for you. Bring your storm sash into our shop and we can turn it around quickly, usually in just a day or two. Alternatively, we can send our technician out to your home to replace the storm glass on site. We keep a large inventory of storm window glass so we can cut and reglaze your storm sash in quickly. We stock commonly used corner keys and gaskets to repair tattered frames to make them like new. We have served the Rochester and Syracuse communities with their storm window needs for longer than any other glass company and we are eager to help you with your storm windows. If your storm windows break we can fix them fast. Request a quote or contact us for more information on our residential door products.